Classrooms are built on a foundation of mutual respect, student-student, teacher-student, and teacher-teacher. Classroom management relies on relationship-based discipline, restorative justice, and intrinsic motivation. The classroom is a safe space where all children have the room to thrive and learn. In a classroom built on mutual respect, students form strong friendships. 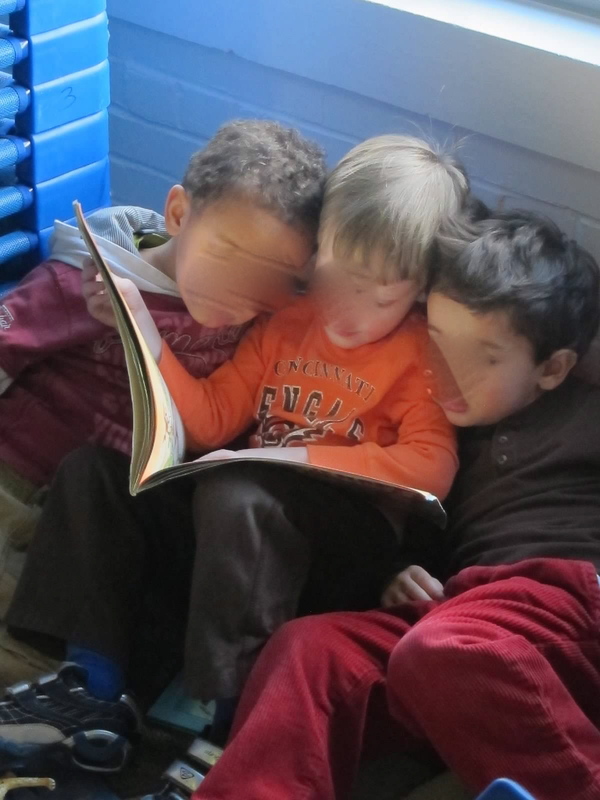 Here, three students who all wanted to read the same book decided on their own that they could look at it all together. The Inspired Teacher views all children as experts as expressed through setting high expectations for learners and espousing a belief in students’ innate desire and right to learn. Students are cast as discoverers and explorers and their interests, discoveries, questions, and voice drive lesson planning. Students are a central part of the learning process. 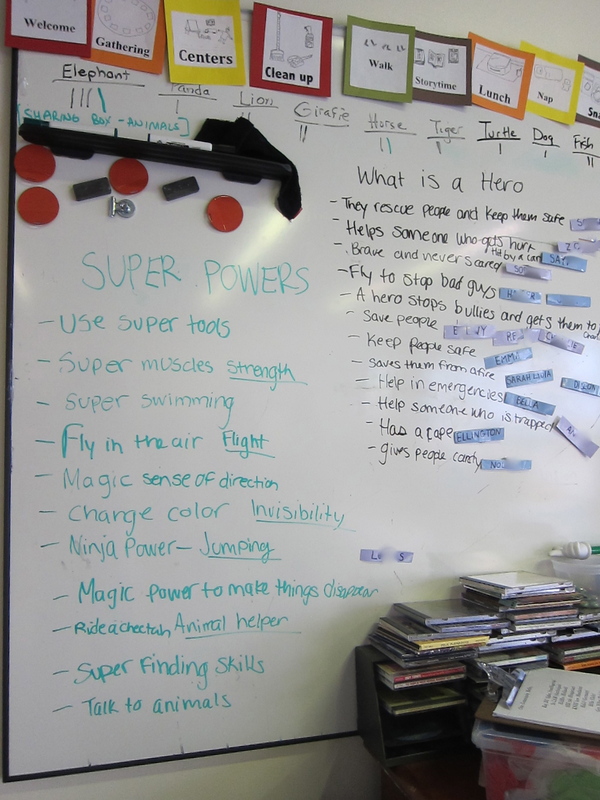 Here, a class definition of heroism and heroic skills are compiled by student suggestion at a whole-group gathering. Students names are on magnets next to their suggestions. Names blurred for privacy. Instruction is designed to motivate and challenge students. Teachers thoughtfully and intentionally plan lessons that naturally inspire children to engage physically, emotionally, and mentally. Students are encouraged to embrace and learn from mistakes and to pursue new discoveries. Students engage in a productive struggle to puzzle through lessons, activities, projects, and challenges. Teaching practice is informed by a wide-ranging collection of evidence of student learning. Multiple types of authentic assessment are collected, analyzed, and displayed. Students are invited to be part of the process, analyzing and reflecting on their own work. 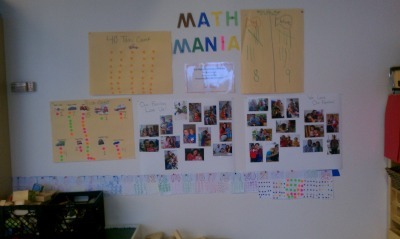 This is a wall of data collected as a class. Students kept tallies of different things we saw on our walks and we made charts documenting these findings together as a class. Below is a number line made by students. Classrooms are joyful places where students and teachers alike are happy, enthusiastic and engaged. The learning process is always regarded as joyful and fun. Students are approached with optimism from an asset-based stance. 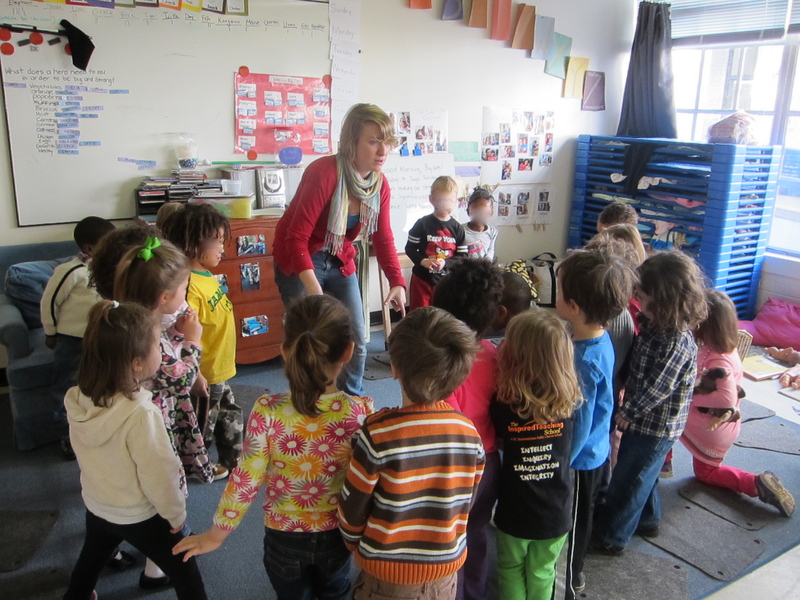 Here, students are hearing the next challenge during a Superheroes whole-group Dramatic Play activity in which we took emergency calls and solved imaginary emergencies around our classroom. At the end, students gleefully recounted what they did to save the world that day.